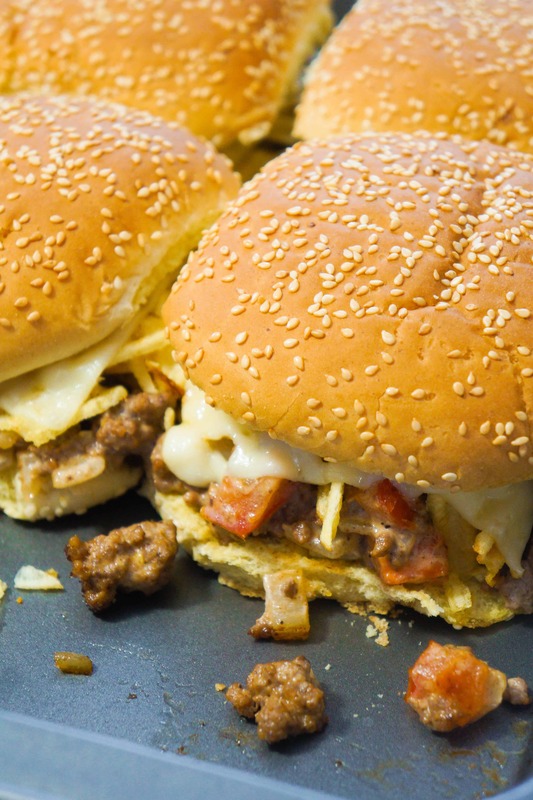 Potato Chip Loose Meat Sandwiches are an easy dinner recipe that will satisfy your burger cravings. 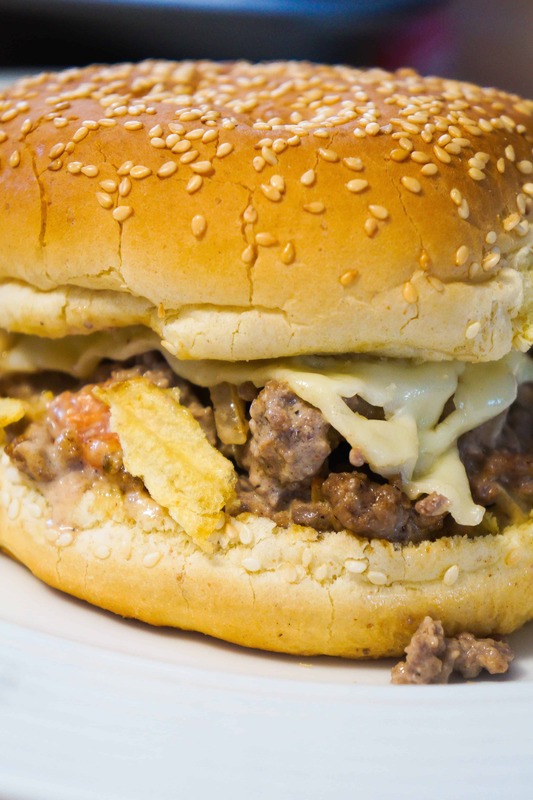 These sandwiches are loaded with crumbled ground beef, Swiss cheese and rippled potato chips. This recipe produces four large sandwiches perfect for a family dinner but the recipe can easily be doubled or even tripled to serve a crowd at your next party. To make these loose meat sandwiches I started by browning some ground beef in a large frying pan with diced onions. Once the meat was fully cooked I drained the fat and removed the pan from the heat. I poured in some diced tomatoes, mayo and Thousand Islands dressing and stirred it all well. I placed the bottoms of some large sesame seed hamburger buns in a baking dish and spooned the meat mixture over them. I topped the meat with some broken up rippled potato chips and sliced Swiss cheese. I placed the tops of the buns on the sandwiches and placed the baking dish in the oven. I cooked the sandwiches just long enough to toast the buns and melt the cheese. 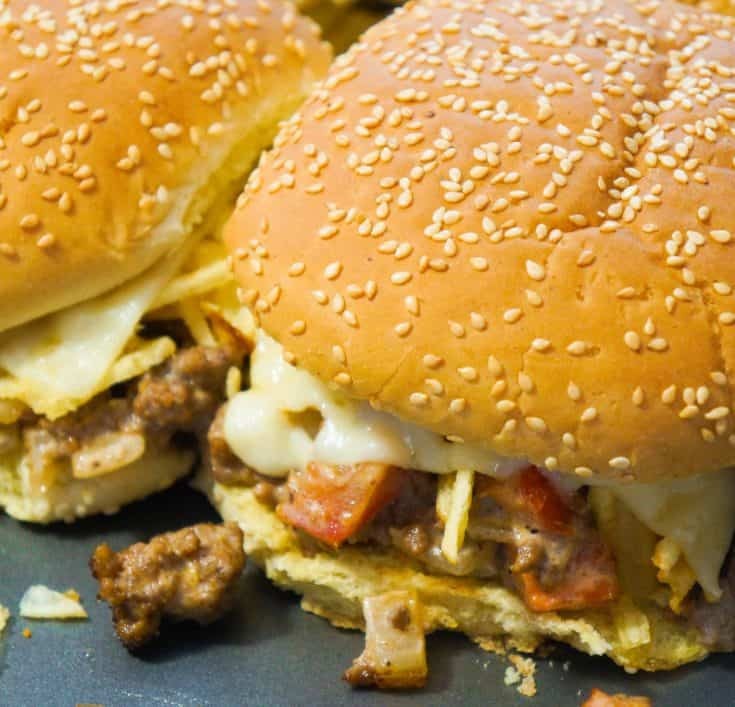 These ground beef sandwiches have a great burger taste and the potato chips add a great crunch and saltiness. 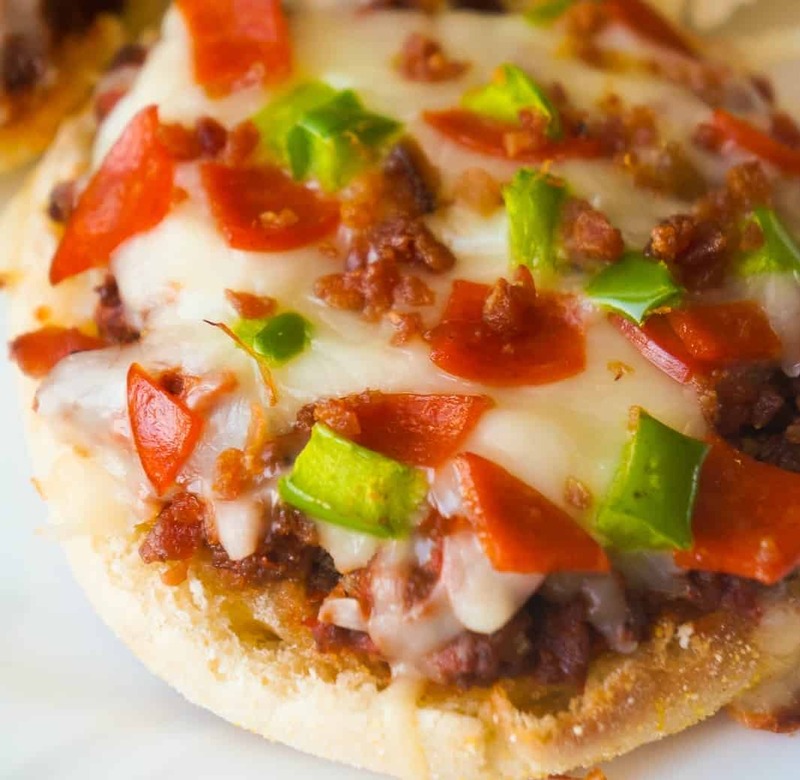 Try these Potato Chip Loose Meat Sandwiches the next time you are in need of an easy dinner recipe and would like a change from the classic hamburger. 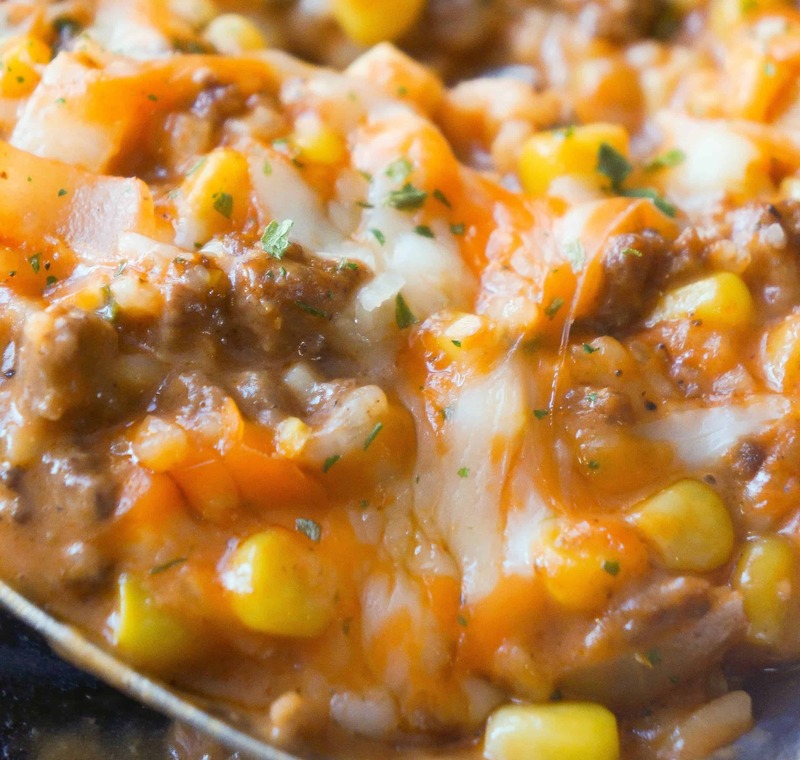 If you are looking for more easy dinner recipes check out Sweet Chili BBQ Chicken Sliders, Shepherd’s Pie Sliders, Loaded Potato Meatloaf Casserole and Chinese Take Out Style Chicken and Ramen. 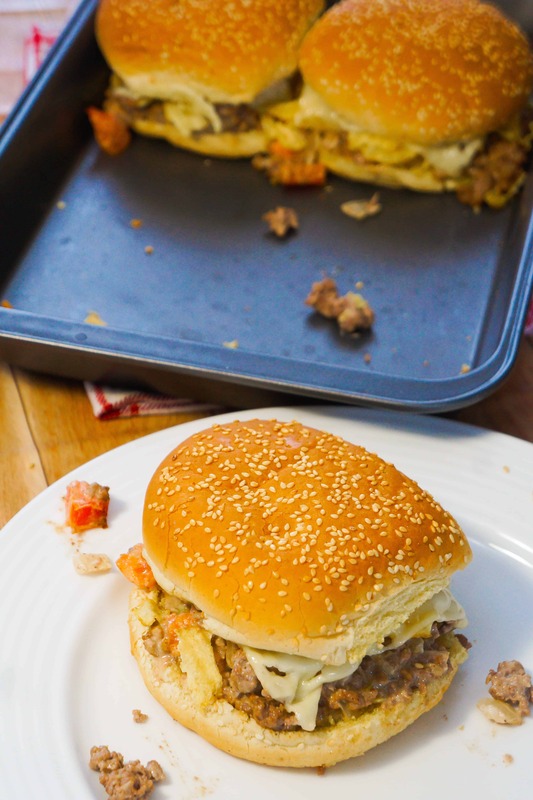 Potato Chip Loose Meat Sandwiches are an easy dinner recipe and fun change from the classic burger. 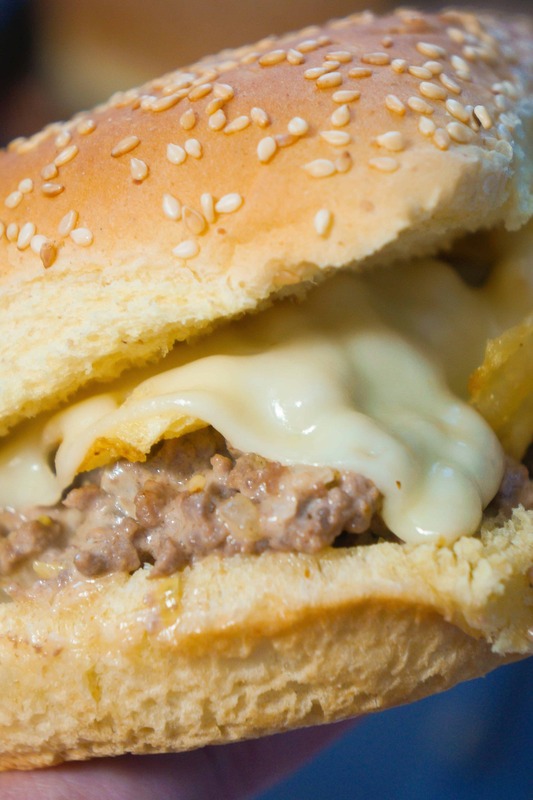 These ground beef sandwiches are loaded with potato chips and Swiss Cheese. 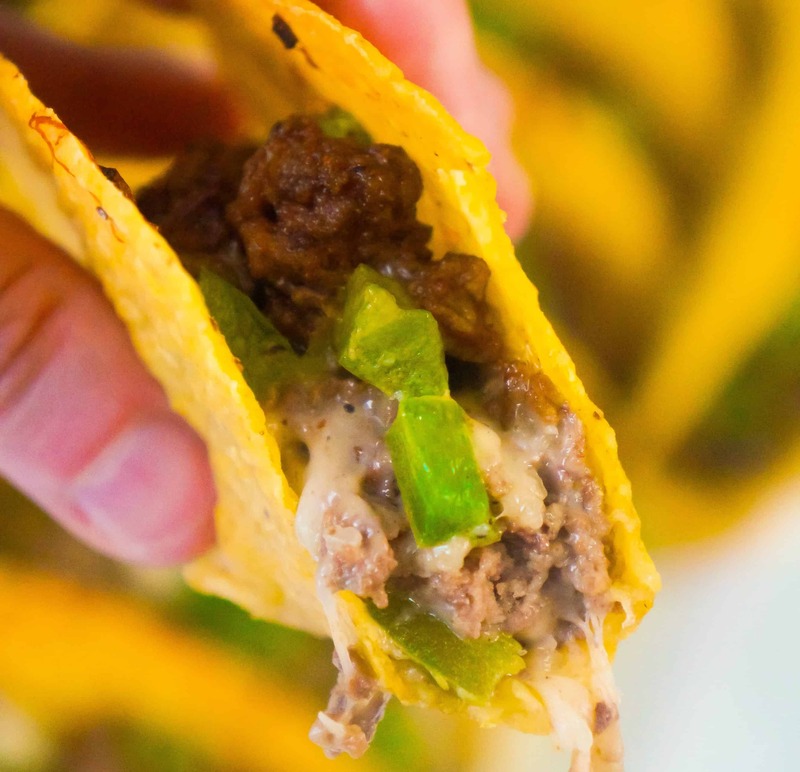 In a large frying pan over medium-high heat, brown the ground beef with a dab of margarine or butter. Add the onions, salt and pepper to the beef while it's cooking. Once the meat is completely browned remove the pan from the heat and drain the grease. Add the tomatoes, mayo and Thousand Islands dressing to the meat and stir well. 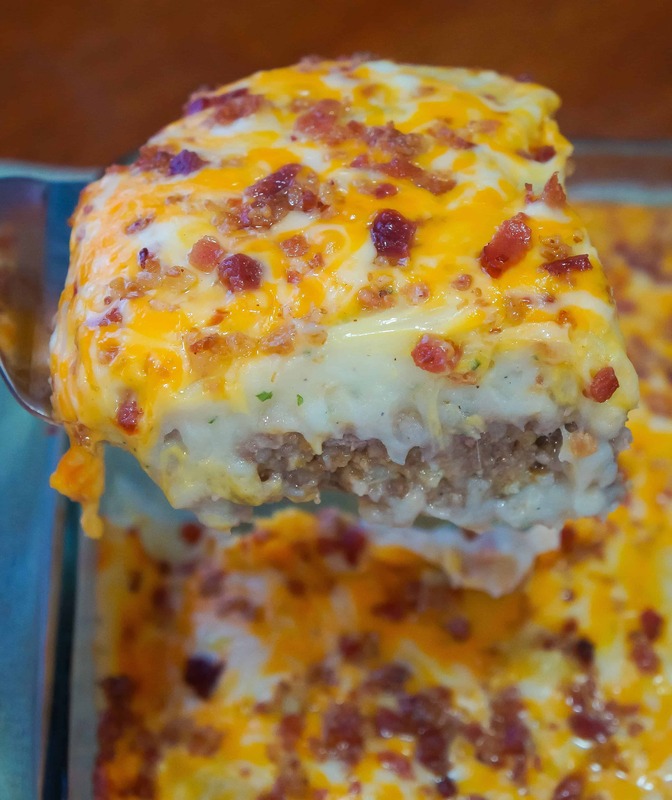 Place the bottoms of the hamburger buns in a baking dish and then spoon the meat mixture over them. Sprinkle the broken up potato chips over the meat. Place a slice of Swiss cheese on each sandwich and then place the top bun on the sandwich. Place the pan in the oven and bake the sandwiches until the cheese as melted and the buns are toasted. 8-10 minutes.